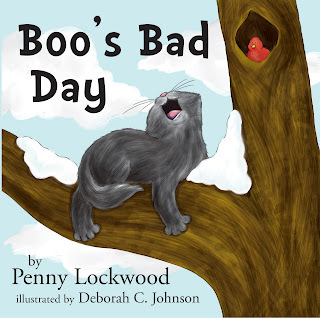 My Featured Friday guest this week is Author Penny Lockwood Ehrenkranz who is currently on tour promoting the release of her latest children's picture story book Boo's Bad Day in which Boo sneaks out of the house and discovers that freedom by himself can be scary. I was given a free review copy of this book which I read with my two sons. The story provoked numerous questions from my 5 year old about cats and why it wasn't OK for Boo to go outside by himself. My 1 1/2 year old delighted in pointing the cat out in each picture and 'barking' at the page (all animals are dogs in his mind at the moment). Both boys were concerned that Boo might hurt himself especially when he got stuck up the tree but cheered when he was safe again. If you missed yesterday's blog stop, please check out http://maggie-lyons.blogspot.com For the next three days, with a different post each day, I'll be at http://virginiajennings.webscom/apps/blog Remember to leave contact information to be entered into the drawing for a free book. Jo, thank you for this thoughtful review, and please, thank your boys, too. I'm glad it was a book you could all enjoy. You're welcome Penny. Good luck with the rest of your tour. Great review. I like the added "Talking Points for Parents." Thanks, Vivian. Getting ready for a school visit soon. It is. Thanks for dropping by. Thanks for following along on the tour Suzanne. Very nice review, Jo. The book is on my to read list. Thanks for stopping by Beverly. You'll love it! Thanks, for stopping Beverly. I hope you have a little one who will enjoy reading Boo with you. Wonderful review, Penny. Best wishes on the tour! Thanks, Karen. Hope to see you again during the tour. Great review. I also like the 'Talking Points for Parent.' This is a useful feature in a children' book review. Penny, have a super tour! Thanks, Karen. I'm planning on doing a school and library visit, and I thought the talking points would be useful there, too.